We’re up to our elbows in chicks out on Metinic. 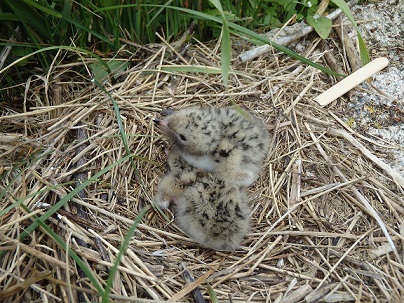 In my last post, I mentioned that our tern chicks have started to hatch. A week later, our little fluffy friends are growing up fast. We can often see our older chicks testing out their wings, although they are still a long way from being airborne. Our resident Savannah Sparrows also have chicks of their own. 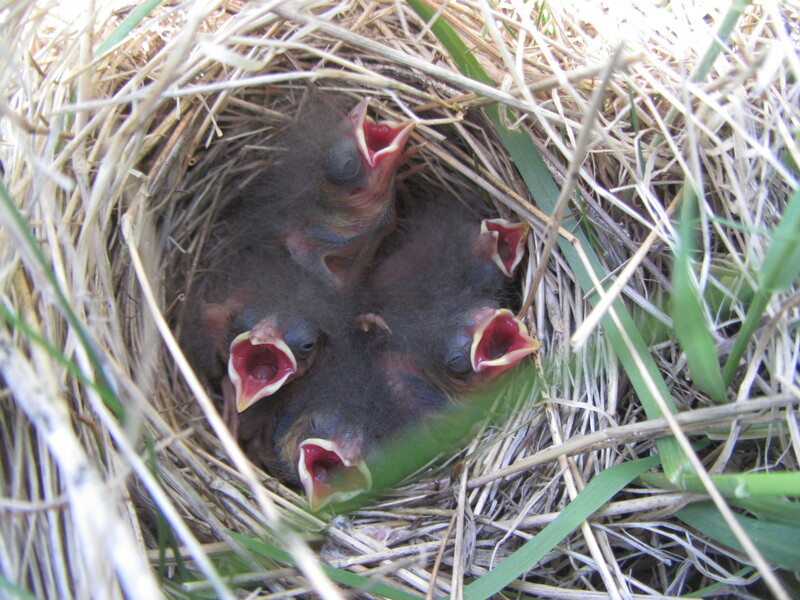 These buzzy-sounding birds build a classic cup-shaped nest in grass on the ground. It can be easy to miss until you see the five squawking mouths. 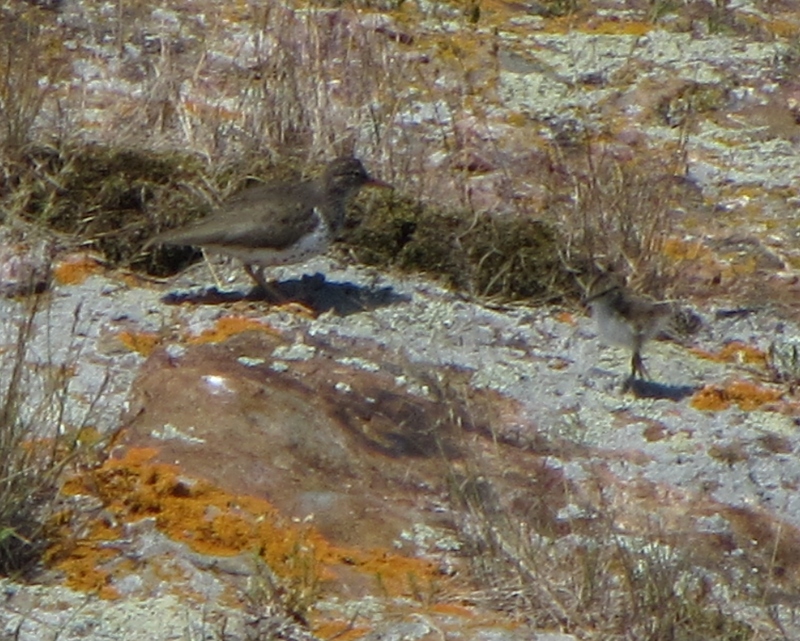 Spotted Sandpipers are Metinic’s only nesting shorebird this year, and our first sandpiper chicks have made an appearance. Despite their small size and their resemblance to a cotton ball standing on a pair of toothpicks, these chicks are up and running around by day one. They do have a parent around to keep them out of trouble though! 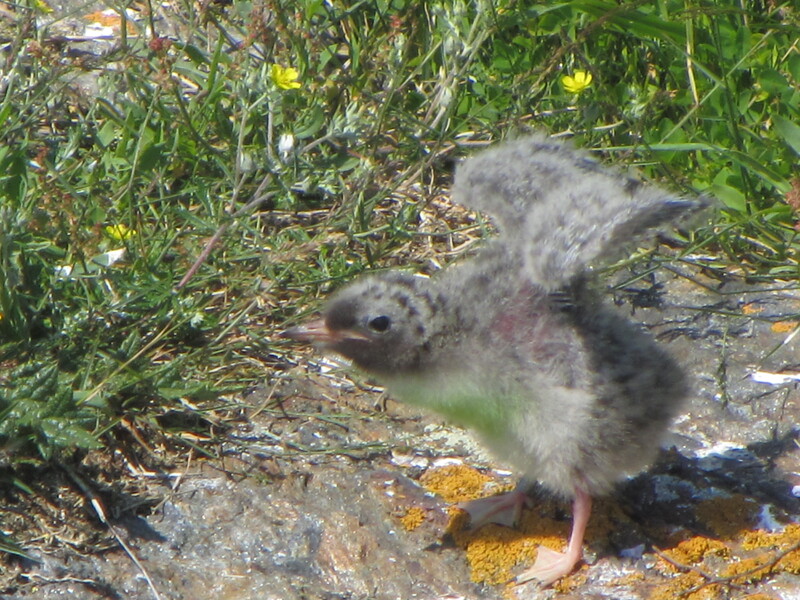 Finally, we found our first Black Guillemot chicks. It’s hard not to love these little black puffballs. Guillemots are also the only alcid to lay two eggs at once, so guillemot chicks usually come in pairs. Of course, Syd and I didn’t want to miss out on the fun of Guillemot Appreciation Day, so we celebrated in the most delicious way we could! More updates as our chicks continue to grow! 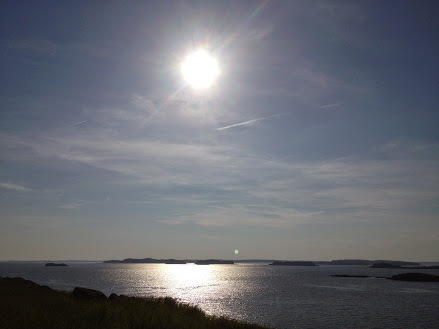 Jim and I did a four hour loop throughout the Blue Hill Bay region stopping to look at places such as Sand Island, The Nub, Goose Rock, Indian Point ledges, Folly Island, and The Hub. We were excited to report a thriving little colony of around 150-200 Common Terns on Conary Nub. Not only did we discover a 4-egg clutch (fairly rare), but also more developed chicks than here on Ship Island, suggesting they hatched around a week and a half earlier. Finally, while this may sound a bit crazy to all our readers out there who live on the mainland, I would like to comment on how wonderful it was to see trees and to smell trees. While we have various types of vegetation out here, including fragrant sea roses, wild irises, and rustling tall grasses, none of them really add up to having a “tree” status. We do have a groove of chokecherry “trees” and our giant cow parsnip is now at least 6 feet tall, but it’s just not the same as a spruce/fir forest. 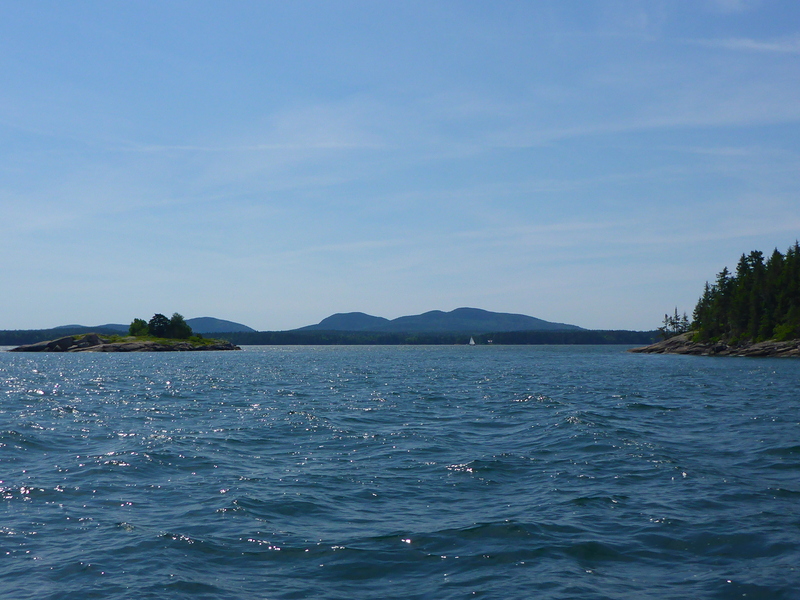 Here is a view of a typical spruce studded island called The Hub off Bartlett Island with the mountains of western Mount Desert Island (Acadia National Park) in the background. This week has been an exciting week for the Brothers Islands. 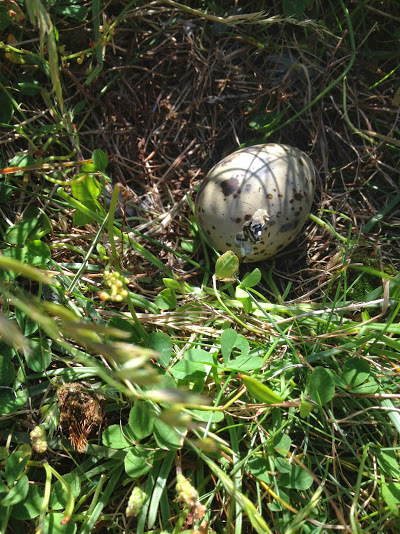 Not only have we switched island technicians (Baxter has switched with Rose from Ship Island for the week), but tern eggs have hatched and we have two little tern chicks! 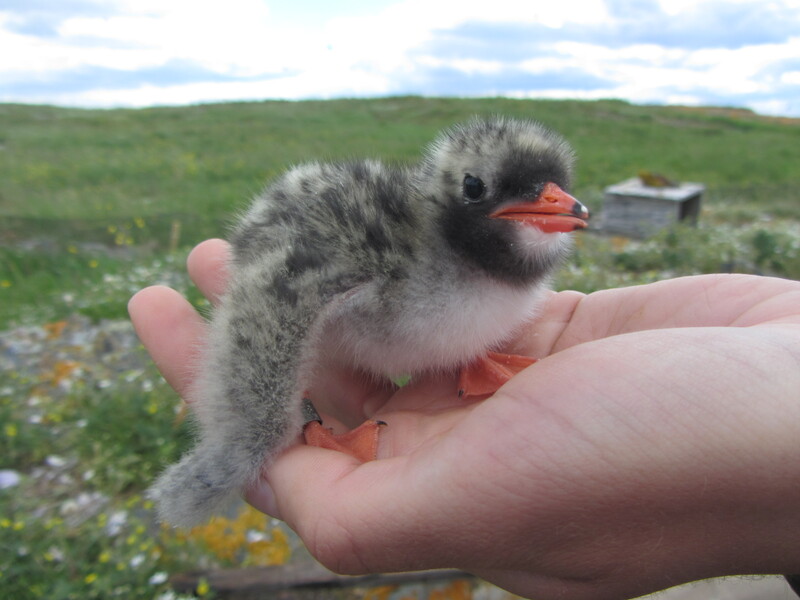 It has been years since tern chicks have been recorded on the Brothers Islands so it is a big success for us. The parents of the chicks have become very protective of their chicks and have been observed chasing gulls, ravens, and even a few bald eagles. When Rose and I go to check for the chicks the terns start dive-bombing us and screeching, apparently they don’t enjoy our company too much. On another positive note we have regularly been seeing four or more terns when we do our observations, which means there is a least one additional tern pair that is interested in our colony. These new additions of terns are usually around to help protect the chicks. We haven’t been able to determine if there are more than three terns nesting on this island yet but it seems very possible. Not only have we been seeing more terns on Eastern Brothers, we have been seeing more razorbills as well. It is not uncommon for us to see a few razorbills each day now, where earlier this summer it was rare. Rose saw seven razorbills swimming with the floating decoys at one point this week. I observed 2 razorbills scouting out Eastern Brothers together which gives me some hope of razorbill inhabitance. For our guillemot burrow research we cover all of the burrows on Eastern and Western Brothers, that we have found, in a week’s time. 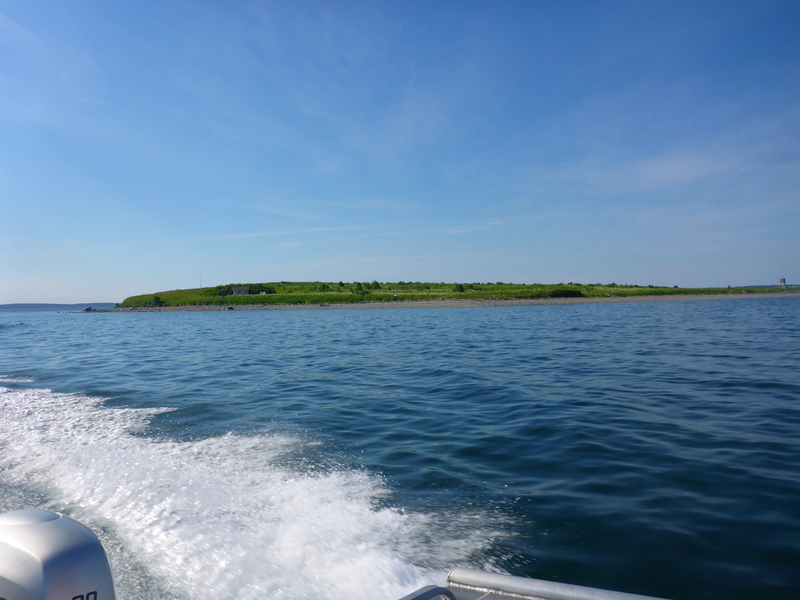 The sections of the island are done in a three day rotation. Today for the first time we heard and saw a guillemot egg piping, the guillemot hadn’t quite made it out of his shell yet, but will be next time we check that section of burrows. Black Guillemots have begun to nest on Petit Manan and for the last couple weeks we have been busy locating burrows and marking them for monitoring. 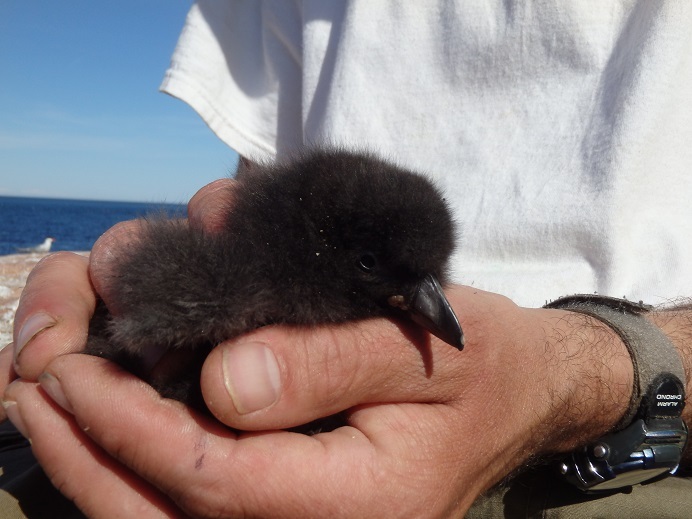 Other alcids, inlcuding Razorbills and Atlantic Puffins have begun to nest, too! Rock crevices and under washed up wood is where Guillemots choose to nest. 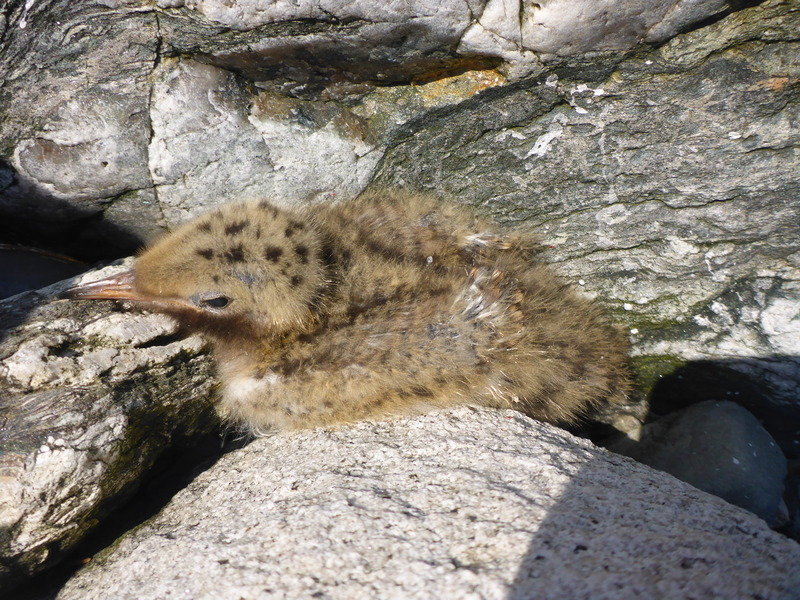 Searching for burrows includes kneeling down to rock or wood level and looking for 1-2 eggs or an adult Guillemot. Finding them could get tricky!! 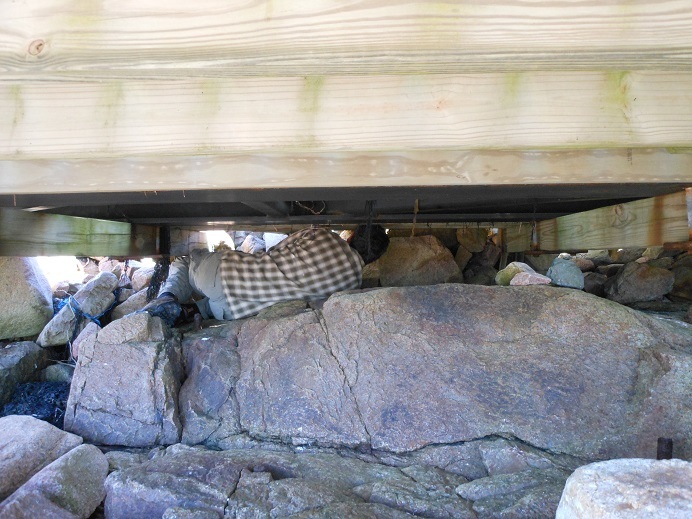 Searching a tricky burrow under the boat ramp. 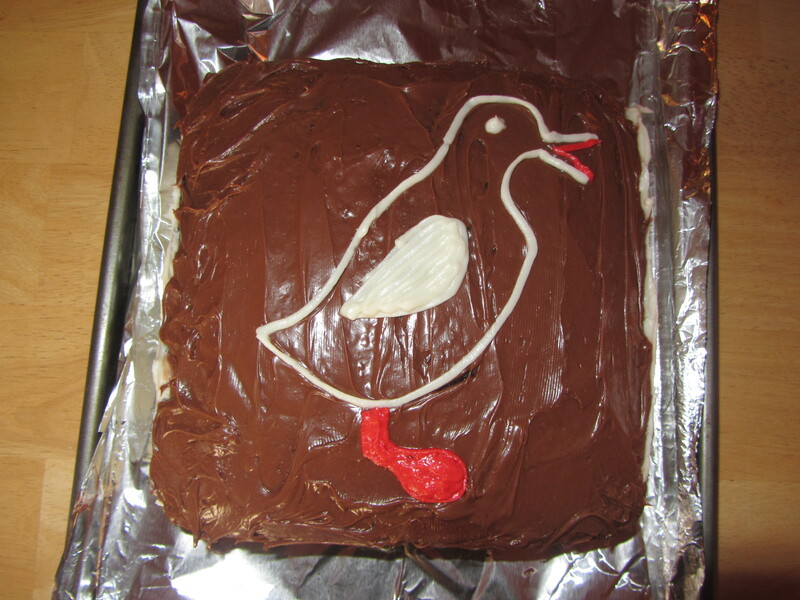 June 27th was Guillemot Appreciation Day and to celebrate we made paper Guillemots to send to the other islands. 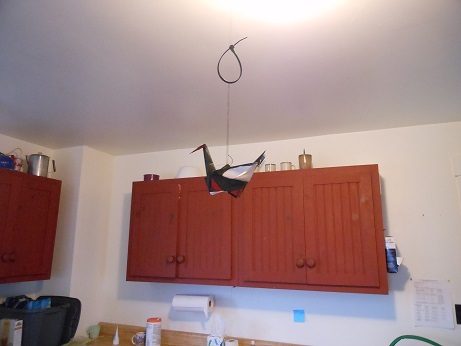 Here on Petit Manan, everyday is Guillemot Appreciation Day with our own special Guillemot hanging over the kitchen table. We searched the whole island perimeter and found 65 Black Guillemot burrows. The island crew will return to the marked Guillemot burrows every 3 days for monitoring. 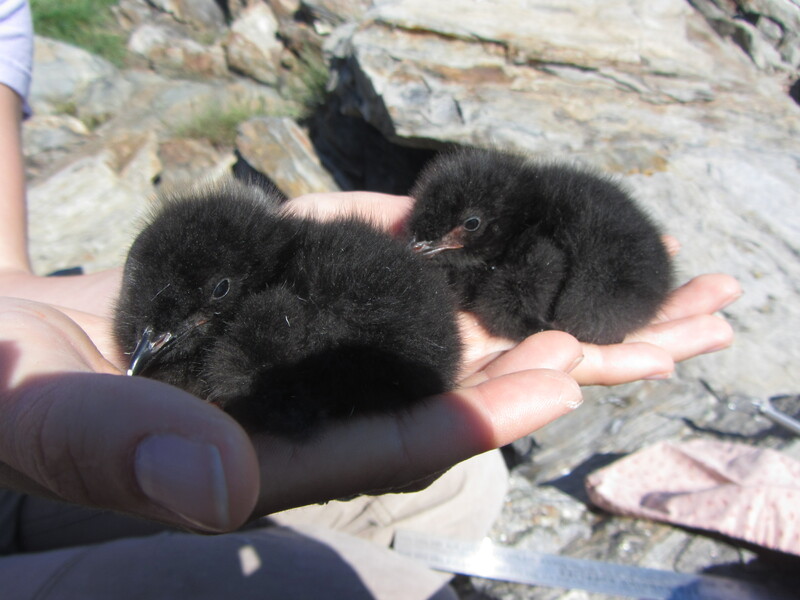 Also, we have 48 Atlantic Puffin burrows and 4 Razorbill burrows. Today, we checked burrows and found 3 Guillemot chicks! Andddd while we were checking for Guillemots we found our first Puffin chicks and Razorbill chicks!! Looking forward to all our alcid chicks hatching! 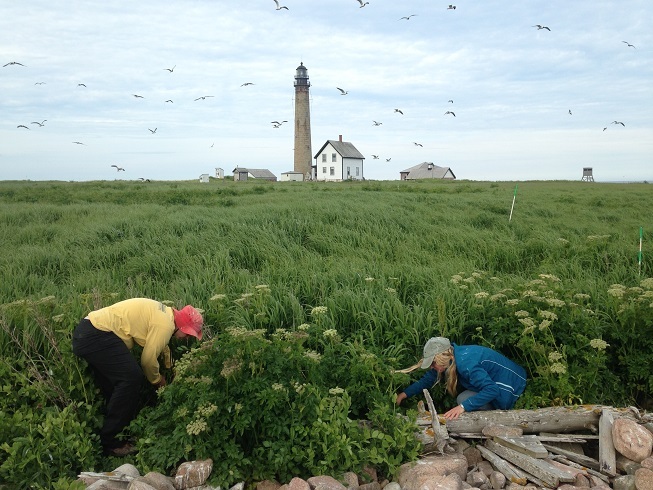 For the past few weeks, a lot has been going on with Petit Manan’s tern colony! 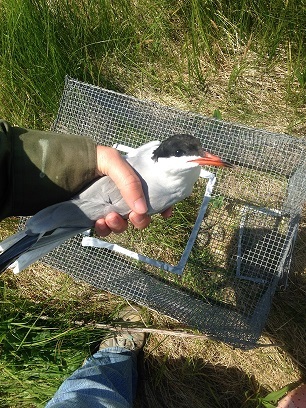 We have been focusing much of our time on trapping and banding both Arctic and Common Tern adults, which is an essential part of our research. In order to capture terns, we use two types of traps—the bownet and treadle trap—to catch adults on their nests. First, we temporarily remove the eggs from the nest so that the bird does not crush its eggs if it struggles in the trap. The real eggs are replaced with painted wooden ones, and a trap is set over the nest. Trappers then hide out in a blind and wait for terns to return. The bownet is a spring trap that is set behind the nest cup and triggered when the adult sits on two monofilaments stretching over the “eggs.” This trap has a metal frame and netting which springs harmlessly over the bird to contain it. The treadle is a small cage trap with a door, which the tern must walk through to trigger its closing mechanism. 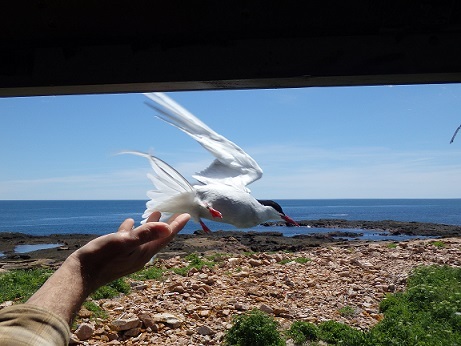 When a tern is captured, a researcher runs out from the blind to retrieve it and replaces the fake eggs with the real ones. Each tern receives a metal band with a unique number on one leg. Every Arctic tern also receives a field readable band with an alphanumeric code on the other leg, so that it can be easily resighted from a distance. We take several measurements, including mass, wing chord (wing length), and head/bill length before releasing the tern. 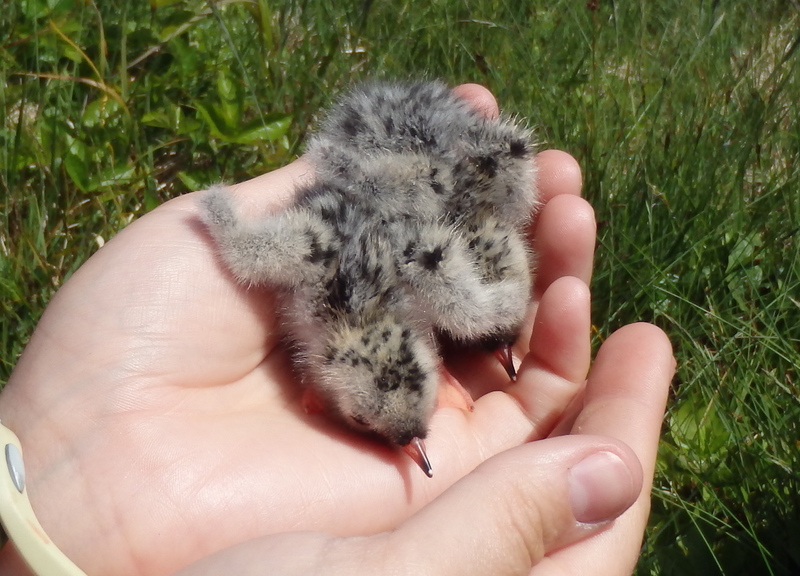 We found our first tern chicks of the season on June 20! Every day we are finding more chicks, and banding them as well. As the season continues, we will be closely monitoring their growth, survivorship, and diet to learn about the colony’s overall health. Stay tuned for more posts about these little cuties! 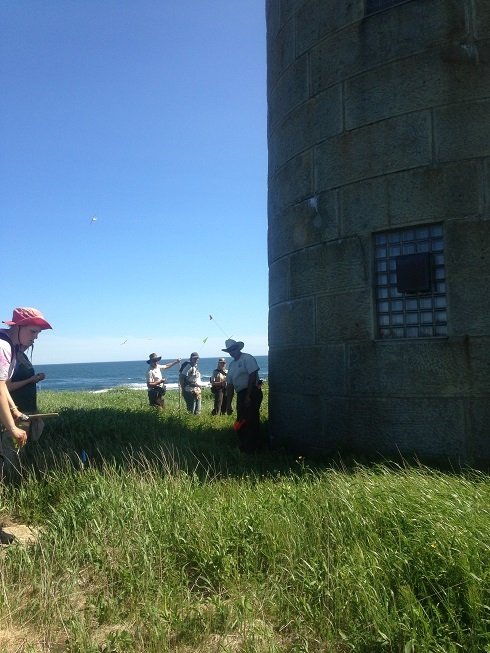 On June 19 and 20 the island crew, along with the invaluable help of Refuge staff and volunteers, completed the annual Gulf of Maine Seabird Working Group (GOMSWG) Census where over the course of two days we attempted to count every nest on the island belonging to a tern, gull, or eider. In order to do this, we all spread out in a line and called out nests to the person recording. 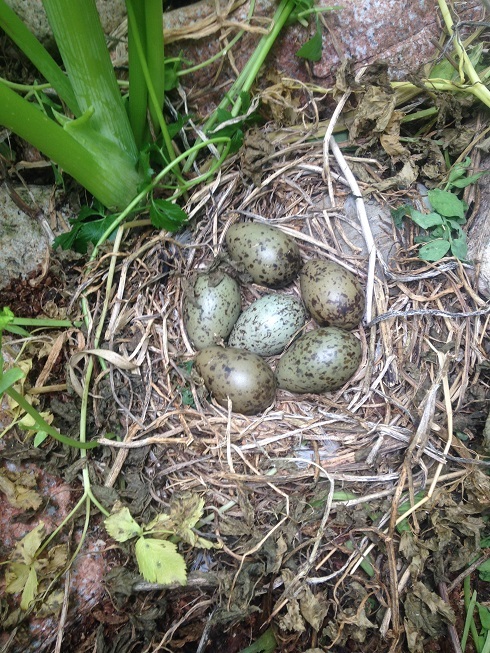 During the census we came across a few oddities, such as Laughing Gull eggs in Eider nests and gull nests with double clutches. 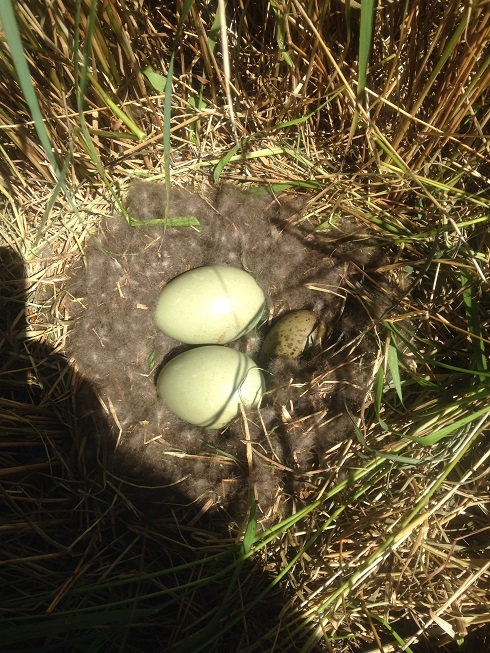 A double clutch of gull eggs – normally they have only 3. This could be a case of two females nesting together. 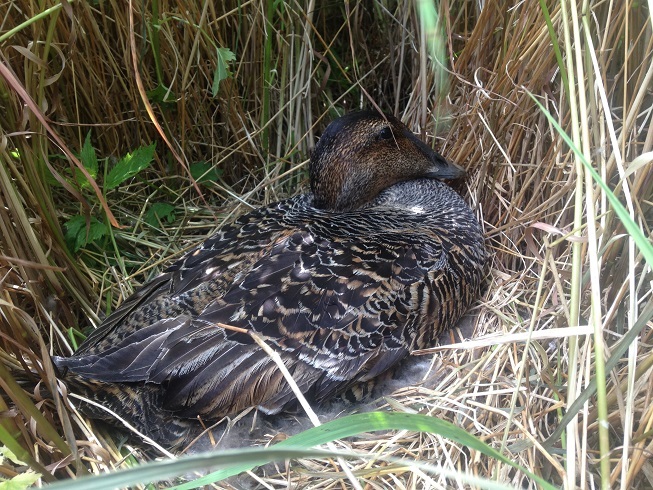 In addition to all these nests, we also found female Eider hens sitting quietly on their eggs in the vegetation hoping to go unnoticed. Usually, we leave these ladies to their incubating, but during census we catch them to read their bands or apply new bands if needed, helping us keep track of them in the future. 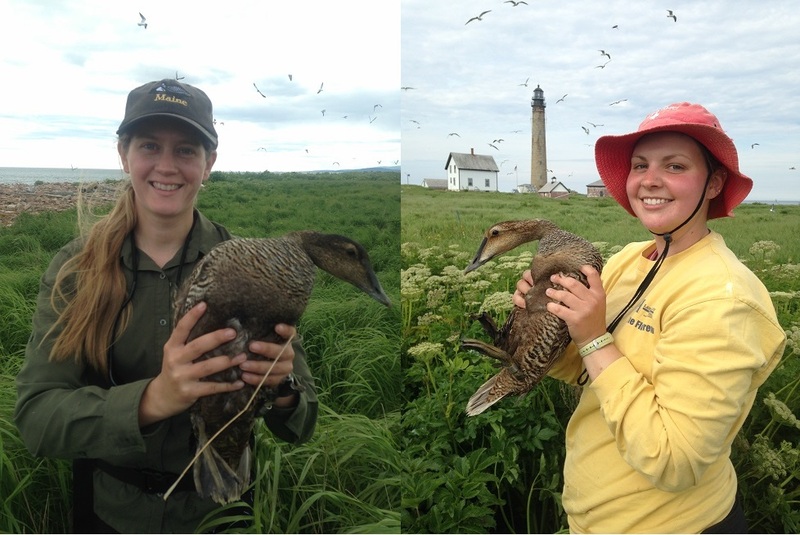 Julia and Brittany as successful Eider-catchers! After tallying up all the numbers and accounting for all the Common and Arctic Tern nests we marked with colored flags, we have 1203 tern nests, 670 of which are Commons while 533 are Arctics, 521 Laughing Gull nests, and 54 Common Eider nests! We do the puffin/guillemot/razorbill census a little differently, using the number of burrows we find throughout the season combined with how many we see on the island from day to day, so we will have those numbers later. 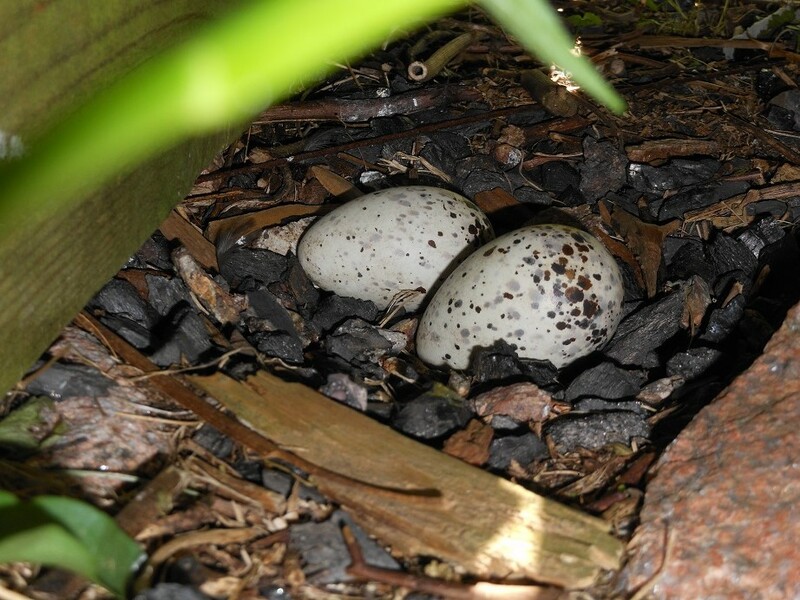 Keep posted for more exciting updates about all those eggs. We’ve had an exciting last week here on Ship Island. Everything is really rolling now! 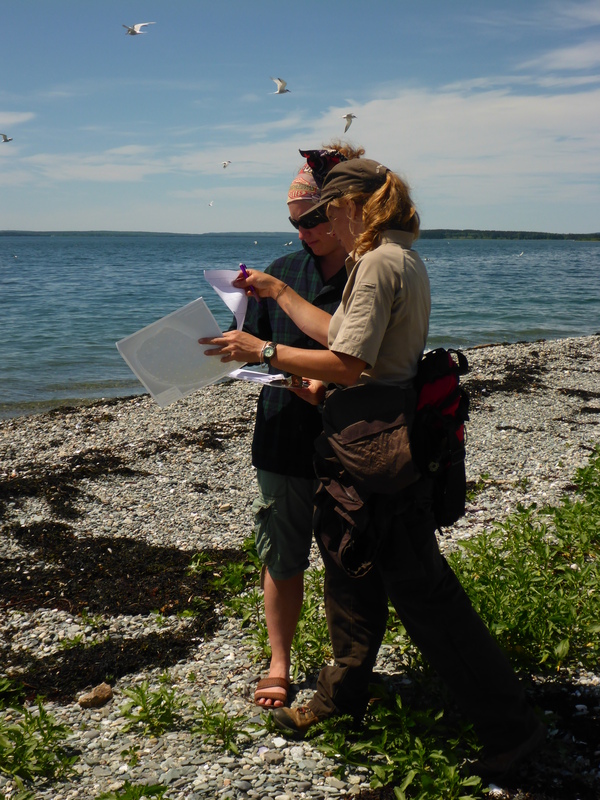 On June 16th we completed the annual GOMSWG (Gulf of Maine Seabird Working Group) census. After factoring in a correction factor, we had a total of 403 nests, which is on par with last year’s count of 436. On the weekend of the 13th a storm coincided with the highest tide of the month, which flooded at least 30 known nests and more than likely 50 more. Because of the flood tide and the slow start to the season, we were all surprised by such a high number, however, we continue to see new eggs throughout the colony. On top of the census, we have been busy getting ready for our productivity studies. Depending on the size of the colony we try to monitor 5-10% of the colony. Throughout the season we check the egg status and then hopefully the chick status after that. We use these selected nests as a way to gauge the success/failure of the whole colony. As has been posted in the past, terns can be quite aggressive towards intruders, which includes us. When working in the colony this includes their constant kipping at you, but they also enjoy hitting you and defecating on you. 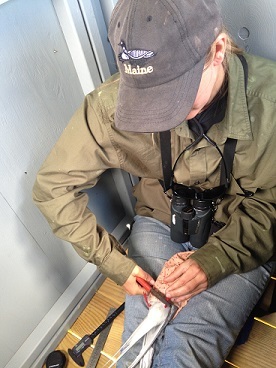 Here is Rose searching for a chick and getting hit by a common tern…this one actually tore her jacket! And now because it’s the only appropriate thing left to do: I am happy to announce the hatching of our first chicks! We noticed starring (appears as slight cracks in the eggs) and then piping several days ago, and on Saturday the 21st the first chicks of the colony hatched. Here is a picture of the newest residents of Ship Island.